Our clients asked us to look at updating the JDP Showroom - a prestigious, local furniture group, based in Long Eaton, Nottingham. The showroom houses the collections of a number of bespoke furniture suppliers including, Wade Upholstery, Cintique and Parker and Farr, to name a few. 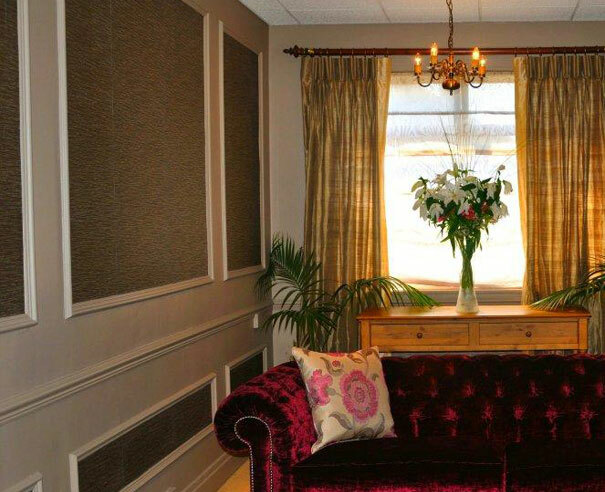 The exciting showrooms exhibit sumptuous pieces in imaginatively accessorised room sets, and we were asked to re-decorate individual room sets in equally sumptuous wall coverings to set off the quality and finish of the furniture. The materials used included a range of imported wallpapers from Nobilis, Paris, which incorporated coverings using mineral content; bamboo and other, textured finishes; as well as a range of paints and woodwork finishes. Works were completed on time and to budget, to enable our clients to open their showrooms to the public in April for the new range exhibitions.